Spring is almost upon us. 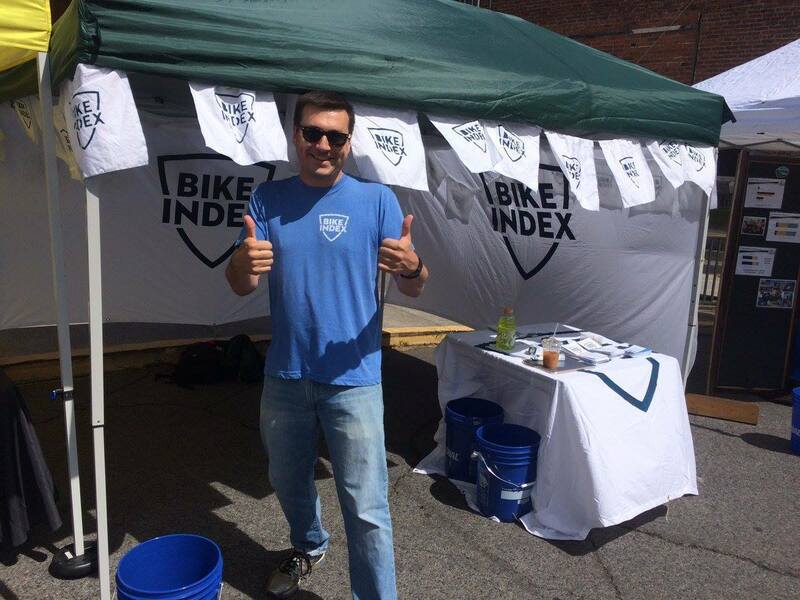 While it isn't quite warm enough for everyone everywhere to be out riding, it is the perfect time to host a Bike Index registration drive. Hosting a registration event is as easy as setting up a tent (or just a cargo bike!) 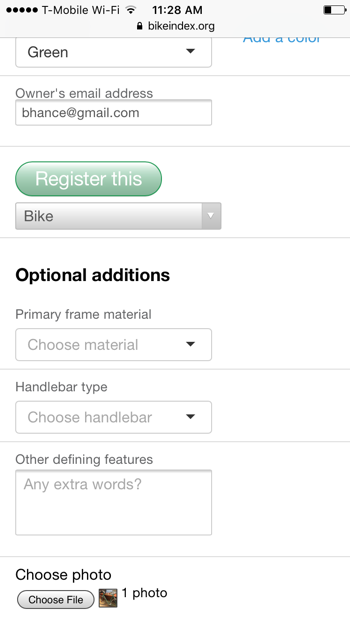 and using a smartphone to get bikes registered in Bike Index. Our friends in San Jose, CA hosted registration drives last week at their local grade schools to get students and community members registered in Bike Index. "When police recover stolen property, bicycles are often among the items they find - but they have no way to know if it was stolen, and no way to return bikes back to their owners," said David Witkowski, who heads up Civic Technology Programs at Joint Venture Silicon Valley and who coordinated a bike registration event for Willow Glen Middle School in San Jose. "We see Bike Index as a way to help reunite bicycles with owners, and to help police build felony cases against habitual bike thieves and the chop shops they work with." Witkowski and a few other parents and teachers in the San Jose grade school communities hosted Bike Index registration drives to register almost 200 bikes in Bike Index. "Bike thefts have become an increasing problem in our community and more specifically, on our school campuses," said Cheryl Lawton, Principal at Branham High School in San Jose. 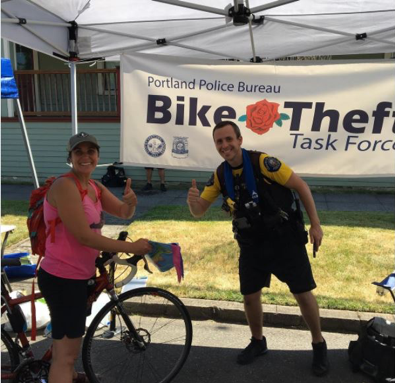 "We are hoping that through our students' and community members' registration with Bike Index, we can slow down, and ultimately prevent, the large number of thefts." To hold your own registration drive, all you need are volunteers and a few smartphones. This works on Android or iOS phones, so it doesn't matter what kind of phone you have - and there's no app to install. All you do is open a URL, enter some bike info, take a photo - and that’s it. With a few volunteers and a little planning, you can quickly register many bikes - it is not uncommon for well-organized groups to register 300-400 bikes per event. Before your event happens, email this URL out to your volunteers. It also helps to bookmark this URL on your phones. 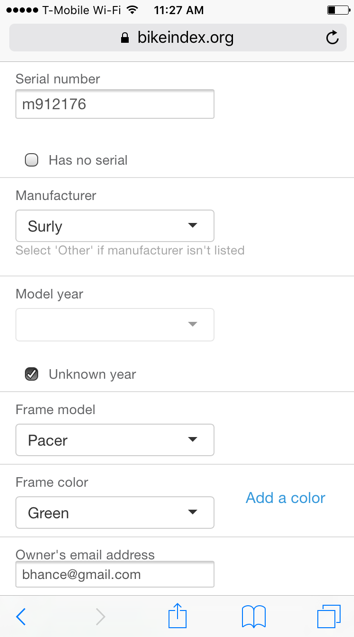 To create your organization’s mobile URL, follow the formula: https://bikeindex.org/organizations/SHORTNAME/embed_extended - You can find your organization's SHORTNAME in your Bike Index organization's admin panel. Lastly, to add a photo of the bike, scroll all the way down to the bottom of the page and click “Choose photo” Doing so lets you take a photo of the owner with their bike - possibly while holding up the whiteboard with their serial on it as shown previously. Once that is all done, press the large green “Register this” button. 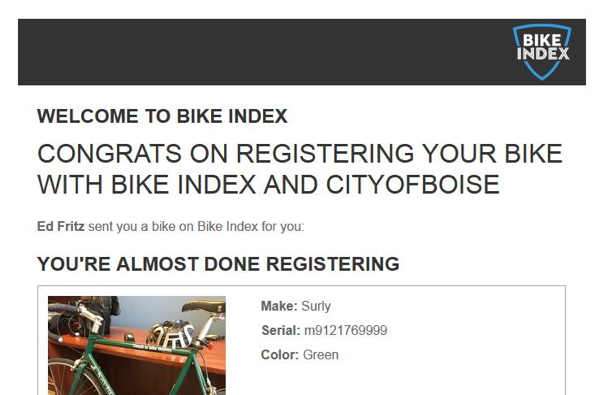 This may take a few moments to upload, but when you see the green “Success” message, it means you've registered that bike. Emails the owner & welcomes them to Bike Index, and encourages them to register more bikes, upload photos, etc. Slow phone/low mobile signal = slow uploads: If you are in an area where the mobile network isn’t super fast, or you don’t get much signal, this will slow down your process significantly. If this is the case, we’ll often just skip the photo (since the photos take the longest to upload) and ask that the owners add their own photos later. The last entered email address always stays in the form: By design, the last email address you entered stays loaded into the form. We did this with the assumption that some owners will be registering multiple bikes, so leaving that email pre-loaded in the form saves some time. This always generates some confusion, though, so we may be removing this in the future. For the time being, you’ll have to clear that “leftover” email address out manually with each new bike’s entry. And that's it! Honestly, it's pretty easy, and it's a great way to spend a sunny day registering and protecting bikes in your community. As always, this is a free service, and we're always just an email away if you need any help with the process.